Maintain a humble attitude of ‘I don’t know’ so you can find truth because if you lose it, you’ll step in a steaming pile of dogma. ‘Hey? Where’s he going with that?’ you think and follow the link on ‘I don’t know’ to find a spiritual message for the Page of Swords which springs from James’ thinking about a quote from Byron Katie – There’s a lot of freedom in ‘I don’t know’. 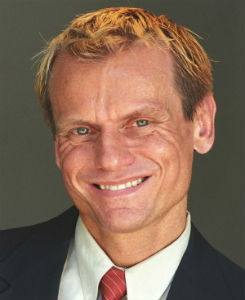 James Ricklef is a Tarot professional – reader, author, teacher and deck creator. 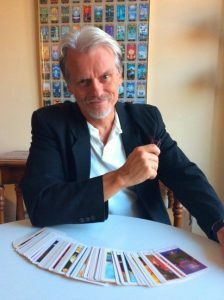 He has published six Tarot books, including The Soul’s Journey, Tarot Reading Explained and Tarot Spreads – Get the Whole Story. For Global Spiritual Studies he has recorded two sets of master classes, Soul Food for Tarot Readers and Millions of Tarot Spreads. LINDA: What led you into Tarot? JAMES: I’d been interested in various aspects of the occult since my adolescence, but had not learned much about the Tarot beyond a basic familiarization until about 20 years ago when I was writing some SF/Fantasy fiction and doing research on various occult topics. As I delved deeper and deeper into Tarot, I got more and more fascinated by it. In short, I fell in love with it, and it supplanted fiction writing as my passion. As an interesting note, I had studied the I Ching years earlier, but it didn’t grab me as wholly as did Tarot. Perhaps part of it is that the I Ching doesn’t have the lovely pictures. LINDA: You say you’re a ‘Fortune Helper, not a Fortune Teller’. There’s a whole philosophy behind that statement, isn’t there? JAMES: Yes, absolutely. It expresses the core of my Tarot Philosophy, which you can read more about on my blog. Briefly, though, here are some of my thoughts…I believe that the future isn’t etched in stone — we all have the power to shape our future and our lives. So I want my readings to help people become empowered to do that, to make practical, life-affirming decisions and to take creative and proactive actions. And so I think the most important aspect of a Tarot reading is that it should be helpful, useful, uplifting, healing, and enlightening. That’s what I strive for in my Tarot practice. LINDA: From a client’s perspective, what do you think are the key skills a Tarot reader needs in order to be effective? JAMES: Beyond the obvious reading skills, other important skills include empathy, good listening skills, a willingness to avoid being judgmental, honesty, sincerity, and a genuine desire to help people. Oh yes, and the ability to keep secrets—confidentiality is a must! LINDA: Are there topics you steer away from when doing readings? And if so, why? JAMES: There are several major types of readings I avoid. Firstly, doing a reading to see what the future ‘will be’. I’ve already talked about how the future isn’t etched in stone. If the querent agrees with that concept — that they can change their future based on the information and advice in a reading — then we’re good to go with a reading. (In my readings, any ‘future’ cards in a spread are actually about ‘probable’ or ‘possible’ futures.) But if someone insists that they want to know what the future absolutely will be, I’ll pass on that because it conflicts with my beliefs about the future and our ability to change it. Interestingly, though, that rarely happens. When I say something like, ‘Instead of trying to see if such-and-such will happen, how about if we do a reading to see what you can do to make that happen?’ people usually say, ‘Sure! I didn’t know you could do that’. Next on the list – readings about other people. I won’t be a psychic peeping-tom. For example, I won’t do a reading for a question like ‘Does John really love me?’ John isn’t there, and he hasn’t given me permission to look into his life, so that seems unethical to me. I can, however, do a reading to see what the querent needs to know about his or her relationship with that other person. I don’t do readings to tell people what to do or what decisions to make. That’s disempowering. However, my readings do give people insights to help them make their own decisions. So for example, if someone is faced with a choice between two options, I won’t do a reading to say, ‘You should choose Option 1’. Instead, my reading will highlight the pros and cons of each option so that the person can make their own decision. And finally, legal, medical, financial, psychiatric (etcetera) advice. If someone needs a physician, psychologist, lawyer, financial advisor, accountant, or any other professional service for which I am not qualified, I will encourage them to seek such service from someone who is qualified in that area. This is a legal issue as well as a matter of ethics. LINDA: You’ve touched on some ethical issues there. Are there others you believe Tarot readers need to be mindful of? JAMES: I think everyone who plans to do readings (especially professional ones) should take some time to create their own code of ethics. You can see an example on my Tarot Ethics page. LINDA: From the amazing amount of information about the cards and readings on your website and blog, you’re clearly a born teacher. What started you on your blogging journey? JAMES: As I noted previously, I didn’t just get interested in the Tarot, I kind of fell in love with it. So of course I want to share what I know about it with other people. And it doesn’t hurt that I like being a writer too (as evidenced by my many Tarot books). In fact, I find that writing blog posts keeps me on track sometimes when I’m in the process of writing a book. For example, while accumulating material for my book, The Soul’s Journey, I kept myself on a tight one-post-per-day schedule for well over half a year. Consequently, I created the majority of the material for that book (at least, in rough draft form) in a relatively short time. LINDA: In fact, The Soul’s Journey, draws on more than 300 blog posts about Tarot and Spirituality. It must have been satisfying to pull all that together, right? JAMES: Actually, it rather amazed me that I was able to create that many blog posts so quickly, especially considering that on average, they are several hundred words each. Even after I stopped doing one every day, I kept posting them pretty often until I felt I had enough to start putting them into a book. Of course, then the work shifted into the more mundane arenas of organizing, editing, and formatting all the material into book form. It was a lot of work, but I’m happy with how it all turned out, especially when I get compliments and congratulations on the book. 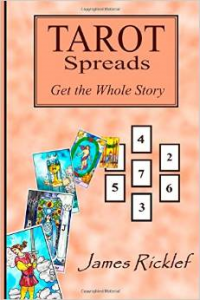 LINDA: You’ve just revised your popular book, Tarot – Get the Whole Story, and given it a new title Tarot Spreads – Get the Whole Story. What’s the significance of adding ‘Spreads’ to the title? JAMES: That’s what the book is about: Tarot Spreads — how to create them and how to use the many powerful ones that I introduce there. Llewellyn published the first edition of that book, and as publisher, they had control of aspects like the book cover (which I was happy with) and the title. I never understood why they didn’t make the title what I have made it now. I think they stumbled on that one, but that’s a more complex issue than it seems, and it’s water under the bridge now. LINDA: You’ve given your spreads some wonderful names. What’s the story behind the ‘Magical Triangle Spread’, for example? the probable outcome of it. That’s quite a simplification of her talk, of course. My spread uses the description of those four points and their diagram. It is very useful for readings where the querent is curious about the implications and results of a proposed course of action. 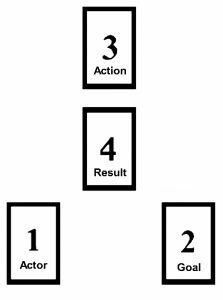 For example, in my book, Tarot Spreads – Get the Whole Story, I do a sample reading for Pocahontas using this spread to help her understand the possible consequences of saving John Smith’s life. LINDA: Your imaginary readings for historical figures or fictional characters are a feature of Tarot Spreads – Get the Whole Story. Why did you go down that path and can you give us an example? JAMES: The readings were intended to be both educational and entertaining (after all, the most valuable learning experiences are the ones we enjoy), but they became more than that. Fictional though they were, these readings often revealed insights that can be valuable for all of us. For example, here’s a request for a reading from the ugly duckling. Why does everyone laugh at me and pick on me? I may not be as adorable as my brothers and sisters, but I can’t help what I look like or who I am. What can I do? Thank you for giving me this opportunity to read for you. I am sorry to hear that you are having such difficulties. It doesn’t seem fair does it? I’ve done the following reading to help you understand your situation better and see how best to deal with it. The Star is a card of hope, and it is a beautiful card with which to start your reading. It shows one large, brightly shining star in the heavens surrounded by seven smaller, lesser stars. I see you as that lovely star. You are different, but this card promises a brighter future when your differences will be seen as something splendid. The King of Cups advises you to learn to control your emotions. Although you may need to be wary of others around you, take care that you do not succumb to fear or anger. This card also urges tolerance of others, even when they are not tolerant of you, and reminds you not to sink to their level. Try to ride above the turmoil of derision in which you find yourself. The reversed Seven of Wands suggests that maybe you are being too defensive, and that it may help to try to be less so. Others may call you ugly names, but is it worth fighting about? This may not be an issue you need to take a stand on. Remember the promise of the Star card and let their taunts just roll off your back. But if they become too physically abusive, you may want to yield your ground and retreat for a while. Then later, when you are in a better position, you can come back and confront them if you like. Again, thanks for asking me to do this reading for you. I hope it helps. For my commentary on this reading see my blog. LINDA: Finally, what sort of advice do you have for people starting out on their Tarot journey? Those 78 cards can be a bit daunting, let alone all the ways you can lay out the cards. JAMES: Succinctly, they should know that they will need to study and (as in the joke about ‘how do you get to Carnegie Hall?’) practice, practice, practice. I’ve put together some suggestions about how to do that on my blog. Honestly, beginners should know that there’s no ‘easy’ way to learn how to do Tarot readings. (To use an analogy: I once heard that you can learn how to play Bridge in an afternoon, but then you’ll spend the rest of your life learning how to play it well.) Beginners should know that anything worth doing takes study and practice, and if you aren’t willing to put in the time to do that, you don’t care enough about it to do it well anyway. My book, Tarot Reading Explained, is suitable for anyone who wants to learn how to do Tarot readings. Does James’ concept of a Tarot reader being a Fortune helper, rather than a Fortune teller resonate with you? 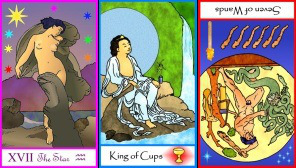 When you go for a Tarot reading what are you looking for? If you’re a reader, what’s your general philosophy? We’d love to hear from you!